Leyard and Planar introduced the Leyard TWA Series fine pitch LED video walls, a family of unique flat panel LED video wall displays featuring low power consumption and outstanding image quality, at InfoComm 2016. 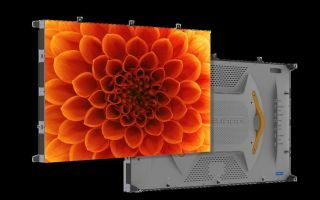 Available now in 1.2 and later this year in 1.8 millimeter pixel pitches, the Leyard TWA Series will, according to Planar, "deliver the pixel density and form-factor similar to LCD and rear projection video walls, but with a seamless image that can be configured to nearly any size." The 54-inch flat panel design offers image quality and 24x7 mission-critical reliability, along with energy-efficient LED video wall designs. Leyard and Planar are showcasing the Leyard TWA Series at InfoComm 2016 in an 8K installation of 64 individual Leyard TWA Series 1.2 millimeter pixel pitch displays. In addition, the booth will feature a technology demonstration of a 4K LED video wall comprised of ultra-fine pitch 0.9 millimeter displays. The Leyard TWA Series offers an energy-efficient design, image quality and 24x7 reliability, making it ideal for both control room and digital signage applications. The Leyard TWA Series is a flat panel LED video wall display offering a slim 54-inch cabinet and the finest pixel pitches available on the market today. The result is a pixel density and form-factor to rival LCD and rear projection video walls, but with a truly seamless solution that can be configured to nearly any size. The Leyard TWA Series is designed with a 16:9 aspect ratio compatible with most displays, making content development and video wall processing easier right out-of-the-box. Leyard TWA Series LED video walls use an average 35 percent less power than conventional LED video wall displays, making it among the industry’s most energy-efficient LED video wall solution. The Leyard TWA Series also delivers a crisp, high contrast image that uses the highest quality black LEDs, black solder mask and MicroGrid Shader to achieve the deepest level of blacks.It is designed for high reliability, long life and ease of service, built to operate around the clock and is available with redundant power supply and video source options to ensure uninterrupted operation in the event of a failure. Individual displays can be quickly serviced on-site. The larger 54” size means fewer displays are needed to create a video wall, reducing potential points-of-service. •A technology demonstration of an 8K native resolution 65” LCD display for pixel-free viewing even at close viewing distances. •The newly launched Leyard CarbonLight LED display solutions, a family of flexible, lightweight displays uniquely constructed of carbon fiber for rental and staging and fixed installations in broadcast, corporate and exhibit spaces. •Planar EP Series of high-performance 4K LCD displays, offered in sizes ranging from 50 to 65-inches and engineered from the ground up for demanding 24x7 commercial environments. Leyard and Planar’s display innovations will be on display at InfoComm 2016 in Booth #C7736.